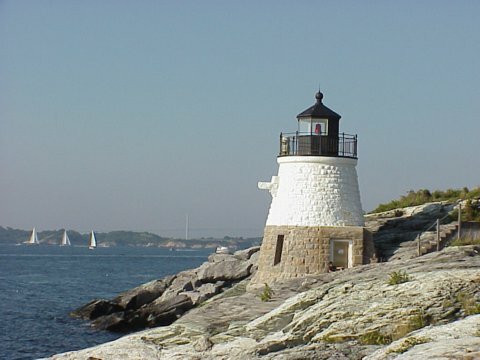 Castle Hill Lighthouse is located on Narragansett Bay in Newport, Rhode Island at the end of the historic Ocean Drive. It is an active navigation aid for vessels entering the East Passage between Conanicut Island and Aquidneck Island. The lighthouse was completed in 1890 on property formerly belonging to the naturalist, oceanographer, and zoologist Alexander Agassiz of Harvard University. Agassiz sold the land to the United States Government for the lighthouse for $1.00. Henry Hobson Richardson drew a sketch for a lighthouse at this location which may or may not have been the basis for the actual design. The structure does not include the residence which was featured in Richardson's sketch. The keeper's house was built, and still stands, near Castle Hill Cove, a few hundred feet away. Although the lighthouse is not open to the public, the shoreline and cliff face where the lighthouse sits are accessible by several footpaths from the Castle Hill Inn and the Castle Hill Cove Marina. It was added to the National Register of Historic Places in 1988 as Castle Hill Lighthouse. Take the Newport Bridge (Route 138) over Narragansett Bay into Newport. Take the exit for the Connell Highway (follow signs for Newport). Follow the Connell Highway for about 0.5 miles and merge onto Americas Cup Ave.
Stay on America's Cup Ave, which then becomes Thames St.
Take a right onto Wellington Ave. Wellington becomes Halidon Ave.
At the Stop sign take a right onto Harrison Ave. Follow Harrison Ave for 1.8 miles and take a right onto Castle Hill Ave. In 0.5 miles take a right onto Ocean Ave. Follow to the end. Park in the parking lot of the hotel/Inn. Walk to the far end of the parking lot and take the path to the lighthouse.